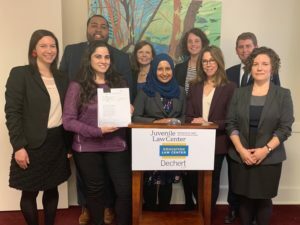 Lawyers from the Education Law Center, Juvenile Law Center, and Dechert LLP filed a class action lawsuit April 11 in Philadelphia on behalf of hundreds of youth who were held at Glen Mills Schools, a residential facility located in Delaware County. This site, the oldest reform school in the country, housed as many as 1,000 boys from all over the country – and the world – at one time. After an emergency removal order of all remaining children at the facility as well as the revocation of its licenses by the Pennsylvania Department of Human Services, it is currently empty; these actions followed groundbreaking investigative reporting by the Philadelphia Inquirer’s Lisa Gartner. The suit maintains that these youth housed at Glen Mills suffered at the hands of Glen Mills leadership and staff. Instead of receiving treatment and services, as required by the Pennsylvania Juvenile Act, plaintiffs claim that they were subjected to extreme and sustained physical and psychological abuse and deprived of an education. The abuse had a particularly dire impact on youth of color – the vast majority of Glen Mills youth were African American – as well as students with special education needs and disabilities, whose educational and other rights were ignored. The suit asserts that officials at the Pennsylvania Department of Education and the Chester County Intermediate Unit allowed Glen Mills’ education program to operate in the shadows without any oversight or monitoring to ensure the educational rights of students. The suit also maintains that the persistent and barbaric abuse went unchecked due to the Pennsylvania Department of Human Services “callous disregard for the safety and well-being of the children in its care.” PA-DHS is the body responsible for the licensing, oversight and regulation of child residential facilities in the Commonwealth. Plaintiffs seek damages as well as other equitable relief for violations of their rights under the Eighth and Fourteenth Amendments to the US Constitution, the Individuals with Disabilities Education Act, Section 504 of the Rehabilitation Act, the Americans with Disabilities Act, and state common law claims.